The airport is in the southern part of the city. When driving from Brno or Olomouc, exit E462 at the signpost Prostejov Jih. Turn right and after 500 m left. 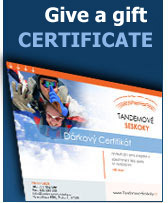 In Prostejov, you can tandem jump with us during the whole year, every week from Friday to Sunday. This season is at its peak and we plan to jump till November. For a reservation of your jump, we recommend that you contact us 14 days before the intended date. Prostejov’s meteorological data on this server are gathered from Prerov meteorological station. However, this forecast is a rough guide and you should not fully rely on it.